Coddenham is a village and civil parish in the Mid Suffolk district of Suffolk in eastern England. 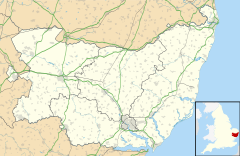 Located to the north of the A14 road, 8 miles north of Ipswich, the parish also includes the hamlet of Coddenham Green. In 2005 its population was 570, increasing to 620 at the 2011 Census. Village facilities include a village shop and cafe, country club offering themed evenings, darts, pool and snooker, pub and the large and popular community & sports hall. During the Roman occupation of Britain, Coddenham was the largest settlement in Suffolk. Today it is a rural village with good amenities, excellent countryside walks, and a large and well equipped children's play area. The village was struck by an F1/T3 tornado on 23 November 1981, as part of the record-breaking nationwide tornado outbreak on that day. ^ "Civil Parish population 2011". Neighbourhood Statistics. Office for National Statistics. Retrieved 19 August 2016. This page was last edited on 8 November 2018, at 11:49 (UTC).